Students from Mexico City won top honors in the ORION-Latin American Youth Go Team Tournament, held Nov 29-30th on the OGS Go Server, reports Siddhartha Avila. The Gimnasio de Go team, led by Mexican siblings Lillian and Omar Zavala, both 9k, and joined by Diego Luciano 25k, won all four matches. Chile’s Colegio Luterano team came in second, while Ecuador’s Academia de Go came in third. A total of 36 kids and teens competed, with three players per team. Schools from México, Venezuela, Ecuador and Chile all participated. The winning team also played a one round team match against students from Dongjak Academy in Korea, which included Jihyuk Yoon, 3k, age 8, Doohyun Kim, 5k , age 6, and Sungjae Cho 6k, age 7, the Koreans won all three matches. Full results are here, while pictures and reports (in Spanish) can be found here. - Paul Barchilon, E-J Youth Editor. 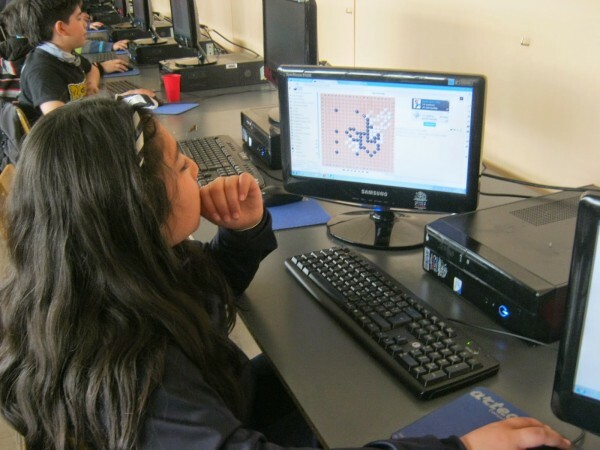 Photo: Students in Chile competing on OGS.